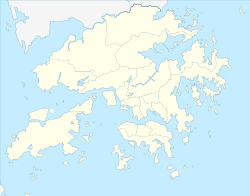 Murray Barracks (Chinese: 美利兵房) was a barracks for the British Army garrisoned in Admiralty, Central in Hong Kong. It was named after Sir George Murray, the Master-General of the Ordnance at the time of construction. It was situated between present Garden Road and Cotton Tree Drive. The Barracks was located at present Asia Pacific Centre and the Officer's Quarters, also known as Officer's Mess, was located at present Bank of China Tower, close to Queen's Road, (present-day Queensway). Across Garden Road was Murray Parade Ground (美利操場) and Queen's Road North Barracks, which was later known as Wellington Barracks. Further west of the parade ground, behind Battery Path, stood the Murray Battery. Murray House in Stanley in 2007. The quarter was known as Officer's Mess in the early days of Hong Kong. It was later renamed Murray House. Before the construction of Bank of China Tower, Murray House was dismantled brick-by-brick in the mid-1980s and later rebuilt in Stanley. ^ Wordie, Jason (2002). Streets: Exploring Hong Kong Island. Hong Kong: Hong Kong University Press. ISBN 962-209-563-1. ^ Yanne, Andrew; Heller, Gillis (September 30, 2009). Signs of a Colonial Era. Hong Kong University Press. p. 89. ISBN 9789622099449. Retrieved February 15, 2013. ^ "Central and Western Heritage Trail – Old Site of Murray House". Antiques & Monuments Office. Retrieved 26 June 2016. This page was last edited on 25 February 2018, at 04:18 (UTC).